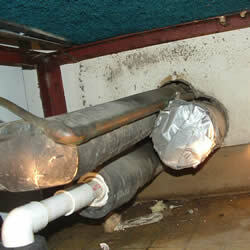 While inspecting an air mover in this apartment, an abandoned pipe was found improperly capped. Duct tape is not an appropriate means to cap pipes and if this leads to sewer lines then sewage gasses can be emitted from pipes, potentially causing serious, life threatening illness. A properly fitting, glued on cap, would reduce chances of sewage gasses entering the apartment. It is highly recommended that this type of problem be further evaluated as it may pose a substantial health risk. When inspecting under this bathroom sink, it was noted by the black discoloration on the wall, that there was a moisture problem. 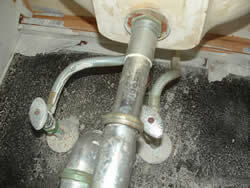 This situation can be caused by moisture found in walls or cabinets from leaking plumbing fixtures, pipes or drains. This bathroom wall was adjacent to a kitchen which had a faucet that had a chronic leaking problem. 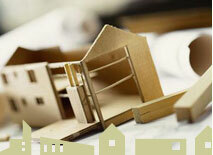 It is recommended that any water leaks be repaired and damaged areas be cleaned, removed and replaced if necessary.